The home of ramblings, roll tables, and shoddy art made by a fan of trash animals. Old school D&amp;D, OSR, 5th Edition, and various other things can find a home here. I don't work for Luka Rejec, Exalted Funeral, or anyone else involved in fantasy RPG publishing. In fact, the opposite is true: rather than them paying me, I am one of the 52 top tier backers for Luka's Patreon (I inched up from the lowest tier to the highest tier over a few months last summer/autumn). I am also the very first backer of the UVG Kickstarter and I copped one of the limited top tier backer slots at that. If anything, Luka and Exalted Funeral now work for me! Suckers. Anyway, that's my disclaimer. They're not affording me any consideration for this rambling madness. You have a week left to get in on the runaway success of the UVG Kickstarter. I'm going to lay out some reasons for you to do that. Ultraviolet Grasslands, as I've mentioned elsewhere on this blog and in the ephemeral wastelands to Twitter, is extremely my jam. It is the culmination of a journey through a gauntlet of influences survived by the eminently talented and hard working Luka Rejec. The reason it resonates so wonderfully with me is that it seems like we shared nearly identical influences despite growing up on opposite sides of the planet and leading very different lives. The same influences left indelible marks on my brain and dwelled in a proverbial primordial ooze somewhere in my cerebrum, unshaped, unexpressed, like some kind of clay without a sculptor. Luckily, Luka's path took him down the road to Renaissance Man Town and he learned to draw and write to give voice and image to his weird inspiration ooze. He made Ultraviolet Grasslands, and the first time I heard of it, it was like discovering the DNA of my own inspiration. It was crystal clear to me. Ultraviolet Grasslands is the result of a young Luka, in Europe and Africa, reading Metal Hurlant/Heavy Metal Magazine. The influence of the art of Druillet and Moebius is inescapable. It is the result of Luka listening to hours of heavy metal, hearing the science fantasy lyrics of Blue Oyster Cult at maximum volume. It is the result of Luka playing Oregon Trail and recognizing, in the green and black glow of the screen, that the difficulty and travails of the randomized journey is the interesting part, not necessarily the destination. It is the result of Luka seeing the 1981 Heavy Metal movie and dreaming of astronaut-driven cars of unknown origin raining from the sky like shooting stars on an August night, trilling fuzzy guitar riffs all the way down. It is the result of Luka reading the words of Jack Vance and picking out the hints of recognizable nods to our own Earth in the distinctly alien future Earth proposed in his vivid prose. Ultraviolet Grasslands is what happens when you grew up with those influences as one of the pillars of your imagination. Luka grew up with these things. I did, too, and because of that, I am incredibly thankful he had the skills and drive to make this book. As a Patron on his Patreon, I got to see the UVG updates and to read the original version of this game. It was an incredible one-man project even then. It was clean, and beautiful, and filled with hundreds of his drawings. There is no doubt in my mind that an illustrated story of UVG would have made the cut and wound up on the pages of a 1982 Heavy Metal Magazine if we gave Luka a time machine. The writing is incredibly evocative - I am a fast reader, and I got so sidetracked imagining what I was reading that consuming the UVG updates took me twice as long as they should have, every damn time. It's no secret that Luka writes with great flair and clarity, with a certain wonderful vocabulary of made-up words that seem to belong where he puts them with great ease. Ultraviolet Grasslands exhibits this in spades. In his Patreon Discord, he has shared some of the improvements and changes to the book; expansions and things which the wise Jarrett Crader and FM Geist have labeled #NeedsMore and which he has revised with new content or explanation. It is quickly shaping up to be an even stronger book, and now we've crossed $75,000 and I believe Matt from Exalted Funeral is forcibly cramming Luka into a dank bunker with an LED lamp and some Copics to color literally every damn picture in the thing. There is no doubt in my mind that the new version will put the old version - which I already adore - to shame. In fact, here's something of a SNEAK PREVIEW of the work-in-progress layout! There are dice. Custom, hot purple UVG dice. Dice that likely will never be seen again. Those of us who mangle the hours of our days in the Discord watched Luka labor over these dice faces, and then revise and revise again. There is a GM screen, which Luka says he is making in a long format. It may possibly wind up being a broad scenic vista of the strange landscape of the Ultraviolet Grasslands. When I remarked that I had dreamed of one based on Sleep's Dopesmoker album cover but with More Color, he agreed that this was not far off from his vision. Whatever we get, it will be incredible, exclusive art. There is a map. It is over 4.5' long. If that doesn't make you lose your actual mind, I do not know what you want from life. A giant map! Of a made up place! The map is going to be accordion-fold, though I believe Matt was looking into making it a roll-up instead if the shipping could be made to be roughly equivalent. There's a batch of add-on postcards. You could keep or send postcards from famous locations in the Rainbowlands like some kind of tourist. For extra points, put together a porcelain prince cosplay with black socks and sandals and LARP your way to the post office when you send these to your confused and possibly estranged friends and family. There may be digital tools, presenting an infinitely-configurable online DM's screen for creation of all manner of randomization specific to the Ultraviolet Grasslands. This kicks in about $5,000 from now, which means we'll likely hit it before the end of the campaign even without a late rush. Press button, get answers. Table after table after table. Luka has even batted around the idea of ongoing, exclusive additions to the book via this route - new tables, new generators, you name it. Who knows! But it's being made by Saker Tarsos, who runs several interesting Twitter bots and also a great blog and who does this whole "computers" thing as his day job professionally. Luka is almost certainly an extradimensional brain-in-a-jar masquerading as a man but the illusion is seamless enough that he has me convinced he is in fact a Slovenian dude who was born into the latter days of Communist Yugoslavia, spent his youth abroad among a myriad of cultures in Africa, and returned to find the home he left behind scarred by war and reforming under a new name with a new government and new history unfolding before his very eyes. He is quite likely able to see in six dimensions and perceives the edges of the color spectrum like a deep sea shrimp but he sure seems to be (to the outside observer, anyway) a dude who criss-crossed the European Union and wound up in Asia. There's a lot to be said about games and art coming from a creator with that kind of background. That's the kind of art I want to help. That's the kind of art I want to consume. A perspective shaped by experiences utterly unlike my own, given shape. When the Kickstarter began to take off, Luka didn't calculate his own payday excitedly like some kind of pen-wielding Scrooge. He made a stretch goal to pay his editors twice as much money for their work. Support projects that equitably pay their contributors. All of Luka's planning in this project has revolved around the schedule. He did the manuscript first, ages ago, in a low-risk environment full of feedback to help polish it. He ran a test project with his print and fulfillment partners at Exalted Funeral (Witchburner). He chose a rare 60-day Kickstarter timeline to ensure most of the work could be achieved before the Kickstarter even closed. He worked hard to pick stretch goals that would not change the final delivery date. He wants the book in our hands in the time promised, and he wants that date to be on the near horizon instead of a year away. We should, as consumers, want to support that attitude. Kickstarter is supposed to help summon capital to enable an entity to take a ready product and produce it and put it on shelves or in user hands - not pay for the R&D phase. 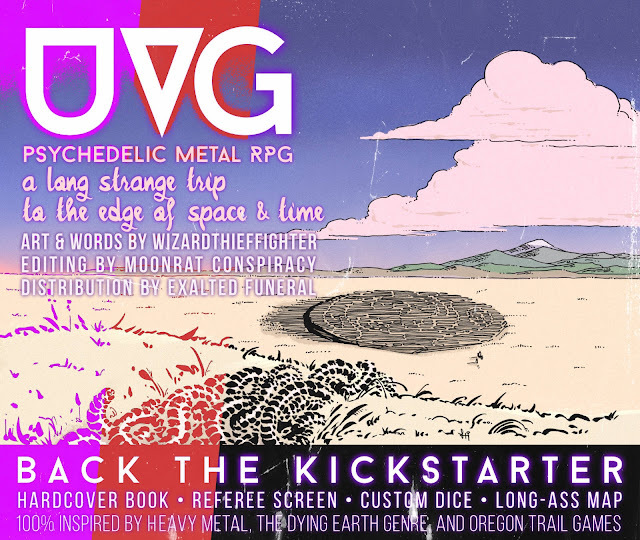 A few years back the RPG community suffered a whole lotta disappointment in a multitude of failed Kickstarters, around when Google+ started gaining steam. It shouldn't have to be that way. Matt and Luka have worked very hard to prove that. I want my dollars to speak for that method. Most importantly of all: if we can get to $99,999, Luka will be cruelly forced to undertake the arduous task of filming a preposterous UVG-themed yoga instructional video for us all to cherish. This began as a running joke for an outlandish goal, but the enthusiasm of gamers has continually brought it closer and closer to reality. I suspect somewhere around $60,000, the panic really started to set in. I'm sure that the $75,000 mark made his blood run cold. The horrifying possibility that he may actually have to do it - with European metal vocals as a backing track (for real) - is likely keeping him awake at night. If you, like me, are fueled by spite towards those you love, then your highest calling must be UVG evangelism just to put Luka on that padded mat, performing Downward-Facing Vome for all of Youtube. He's gonna be famous! UVG is a gorgeous, unique book. It is coming along with a bunch of neat baubles for our collections. It is filled edge to edge with incredible jewels of imagination from one of the best creators of our era of gaming. No two games here will play the same. No two instances of the UVG will be identical. Our tables will be filled with ridiculous disasters, laughter, awe, puzzlement, and more. It is like playing out a documentary in the mind of Moebius while Blue Oyster Cult and Sammy Hagar do the narration. You have a week to shake any doubts you have, assemble your caravan, and cross the expanse on an unbelievable journey through walled towns with flashing neon lights, obscure monuments of arcane hand gestures from time immemorial, and scorching guitar solos. In the glorious Basic/Expert rules of Moldvay and Cook, pickpocketing relies on rolling under a target score on percentile dice. Thieves begin with a 20% chance (meaning they must roll a 20 or less on percentile dice) and gain +5% chance each time they level. Some additional caveats apply as the character advances in level and attempts more complex maneuvers; I advise you to reference page B8 in the Basic book and page X6 in the Expert book for more detail. The important part here is that we all understand how a basic pick pocket attempt works, so I can introduce my subsystem to add randomized flavor items to pickpocket attempts. If the success is 0-5% better than the requisite score (e.g. a 16 rolled for a 20% requisite), roll once on the general contents table, and once on a single applicable subtable. If the success is 6-10% better than the requisite score, roll twice on the general table and twice on a single applicable subtable if necessary. If the success is 11+% better than the requisite score, roll three times on the general table and three times on any applicable subtables. A 3rd level thief must score better than a 30% on percentile dice to pick the pockets of a 1st level neophyte elven archer guarding a tree house. The thief rolls a 15, which is more than 11 better than the required roll of 30. The thief therefore has earned three rolls on the general table and three rolls on any applicable subtables. The DM rolls on the general table three times, the elven table once, and the warrior table twice. The thief successfully steals a handful of goods containing some lint, a wooden spoon, jerky, a harp string, a whetstone, and a leather lace for armor fixtures. Alternatively, if the dice slow you down and/or you hate fun and random chance, just eyeball it and pick the appropriate number of items from each list according to the results. Found on common folk of most varieties, including tradesmen, craftsmen, merchants, travelers, adventurers and military personnel, brigands, and so on. Found on dwarves and those who are in constant contact with dwarves, as well as many miners and smiths. Found in the possession of elves, half-elves, and those who are in constant contact with elves. Found on halflings and those who are in constant contact with halflings. Would also be found on gnomes or other small, homebody sorts of creatures. Flat wooden tray containing small amounts of paint pigments in red, blue, and yellow. Found on mostly-humanoid monsters, such as goblins, orcs, hobgoblins, gnolls, and kobolds. Bipedal snakemen, lizardmen, or other weird hybrids of the animal kingdom might also have these items. Found on magicians of all types arcane; suitable for all mages, witches, warlocks, illusionists, etc. Found on martial characters, such as fighters, rangers, guards, knights, cavaliers, most henchmen, archers, gladiators, and so on. Paladins can also be rolled on this table or the following table. Found on the persons of priests, clerics, paladins, mystics, and so on. Paladins may be rolled on this table or on the previous table. Found on thieves, assassins, brigands, highwaymen, and assorted other criminals. Found on druids, primitive relicts, frontier humans where the old ways still reign, and feral tribes of elves or halflings. In addition to flavor items, you probably were pickpocketing for a specific item - a key on a guard, maybe - or to inflate your own wealth. In the case of the former, if the attempt is successful, you automatically also steal the item in question. In the case of the latter, there's a little more granularity. First, the DM determines how wealthy the target is, and then a d10 is rolled. The result is the value of coins stolen - perhaps a pouch is lifted right off a belt, or a purse is cut and its contents are caught in the thief's outstretched hand. These assume a gold-centric economy, as in TSR D&D; for in the case of silver standards like in LOTFP, please decrement all coin types by one (e.g. listed value of 5 gold coins becomes 5 silver coins, listed value of 4 silver coins becomes 4 copper coins). A roll of 10 naturally requires you to explode the roll, because that's just fun. These values are separate from treasure found on corpses, and should not count against treasure discovered on corpses. If a goblin in your system should have 10 silver pieces on its body when it dies, and it is pickpocketed earlier for 1 silver piece, it should still have 10 silver pieces on its body when it dies. Most monstrous humanoids and rural or disenfranchised commoners, including paupers and those who have taken vows of poverty. 1d10 CP, explode the roll. Many commoners and tradesmen, other adventurers, most clergy, some bandits. 1d10 SP, explode the roll. Specialized tradesmen, landowners, successful merchants, ranking clergy members of organized religions, renowned adventurers, infamous bandits. 1d10 EP, explode the roll. Lesser and intermediate levels of nobility, greedy or corrupt clergy, very successful merchants, bandit kings. 1d10 GP, explode the roll. Kings and queens, heads of state or religions, invincible overlords, and other tremendously powerful folk. 1d10 PP, explode the roll. Hopefully this ruleset helps you make pickpocketing a little more interesting in your games when it comes up. Thieves need their chance to shine too! As an aside, these can also be used as "what is on the body" tables for littering corpses with trivial items. You should feel free to chop the tables up as you see fit. Replace items, expand them to larger dice, etc. If you like this take on pickpocketing, or you hate it and it feels slow at your table, or you just want to take my lunch money like it's middle school again, hit me up in the comments or over on Twitter @dungeonspossums!